Bubba Rex's mighty fine Bar Warrior. thangs of any consequence on this guitar. I hope you're still out there Rockin' steady. PREVIOUS OWNER REPORTED: Here's a very nice old electric guitar; I've looked it over carefully and can find no markings or maker's name. I really know nothing about musical instruments like this so I'm not sure how to go about describing it. It's an interesting item; definitely an old one; clearly used but it seems to me to be sound and in good shape except for normal wear from playing and use. Only name I find on it is "REX" which I took to be the previous owner's name. Missing the second string, but there is a second string inside the case in a little glassine envelope; also the cord or cable for the guitar. Guitar is tight and sound; used but not mistreated; neck is tight and straight; no cracks or breaks anwhere that I can find. Has a small circular access panel in the back and lets you into the compartment where there are some electronic parts. Case is in pretty good condition; handle and all latches in good working condition; it's old, as is the guitar, and shows normal wear. 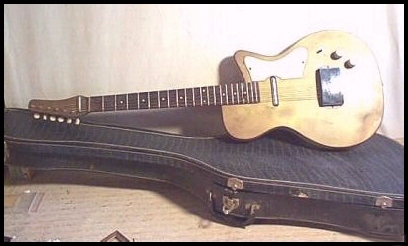 Model 1417 made by the Danelectro Corporation for Sears and Roebuck. Produced in early 1960. Serial number is 3110. This guitar has not been fully inspected / tested in detail yet. Serial number 3110 signifies the 31st week of 1960. I glued a pearl ladies dress button on the upper bass bout of my first guitar, a parlor size Framus. I wish I had $10 for every guitar I've seen "customized" with player's own personal touches; And I dearly love the ones that show a good history of playing ....usually in smoky dive bars ....just like so many of us old timers payed our dues in. 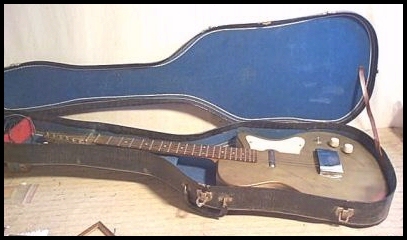 When I received this guitar, unpacked it and did an initial quick inspection for any shipping damage, ....I thought for sure this guitar was a remarkable foreign copy of a Danelectro, ...due to some things that definitely were not Danelectro at all. Pictures below follow the story. It had a hand cover over the bridge, like a Magnatone or other old lap steel; Nope, not Danelectro. It had a strings down-pull bracket on the headstock; Nope, not Danelectro. It had a gold decal on the headstock that said 'REX'. It had a refinish in gold over a factory bronze finish, ...that I didn't like very much at that time (but sure do now) because I didn't have the time to study the guitar when I received it. But everything else looked Danelectro or a darn good copy of Danelectro elements. Now we might recall that in the early 1970's there were company's in Japan and Europe and even American luthiers that were starting to get pretty darn good at copying American guitars, usually with their own flare of ideas. There was even a company named Dynalectron copying Danelectro guitars after the Danelectro factory closed in 1969. Danelectro key staff member Dan Armstrong made some fine guitars out of Danelectro parts he bougt from the surplus sales when the original company ceased operations. A few other good luthiers have assembled or made good guitars from those original Danelectro factory liquidation parts batches that have circulated around over the last 39 years. ------- In any event, the guitar looked well done but didn't strike me as a real Danelectro. I took quick mental notes and packed it back away ....and listed it in my inventory as a Danelectro copy of unknown origins, and used the pictures I bought it from, that are shown below before more recent high resolution pictures on the next page. Fast forward to the fall of 2008: I pulled a packed guitar for a Customer's order and this "sorta-Danelectro" was right next to it; And since I had wondered about it's origins since I purchased it a few years ago, ....I pulled it too along with the Customer's guitar. Let's remove this hand cover and see what's under there, ...looks like a Danelectro bridge. Well I be darn, ....it is; This road warrior is indeed a Danelectro ! 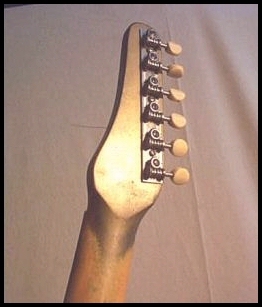 Well what in the world is a strings down-pull bracket doing on the headstock ????? Let's see, ....hmmmmm, no bolts on the back of it so it's gotta be pressed in and a little bit of pulling should take it right out. Pull ...ahhhhhhh ...THERE ...it's out. IT'S A DARN HIGH QUALITY ALUMINUM ROOFING STAPLE ! Barely stuck in the headstock ....certainly not pulling the strings down; Heck, it's a Bubba decoration ....a freakin' Bubba REX customized geetar; Got his name right there on the headstock. 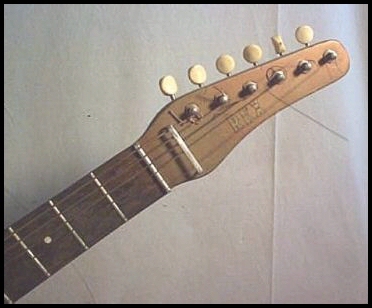 I suppose (having some fun here) that the "string tree" staple was because Bubba Rex musta wanted to be more like another local picker with one of them new-fangled Japanese geetars. AND THIS GUITAR HAS BEEN PLAYED ALLOT since it was "customized"; With finger position wear patterns all over the neck that shows either Bubba Rex did indeed learn to play guitar quite well, ....or someone else did and didn't have the heart to remove Bubba Rex's "customizing". PRICELESS ! This Danelectro has Soul to the bone ! I've never seen a strings "tree" (down-pull bracket) like this one before; And no nuts on the back of it either. Notice the hand cover. Certainly not Danelectro. 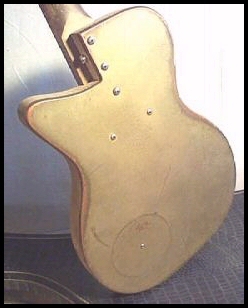 But everything else attached to the body sure looks like authentic Danelectro. And somebody sure played this guitar allot ...so it musta been plenty of Fun. Screws and fittings are like Danelectro. 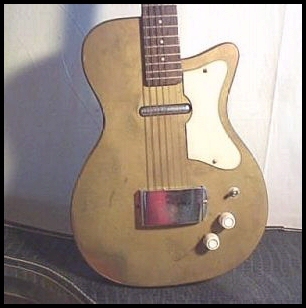 An old copy of a Danelectro that became someon's well played bar warrior? Made in Japan? Europe? The tuners are the same as 1960 period Danelctros. Well, ...gotta pack her away and look closer in detail later. 1960's) duck-tails geetar bands sound so good playin'. Bubba's "cool custom" hand cover, ( so he could rest his hand without killing the strings ). Because it IS Danelectro ! Just wait 'til you see the high res pictures on the next pages ! That's because it's Bubba's roofing staple "custom strings thang, like Duane Freddy had on his geetar". I'm guessing Bubba put that on there when them modern new fangled Japanese guitars came out. Thank goodness he didn't put 3 more teisco pickups and rocker switches on this guitar ! Well then, let's scroll down and take a look at high resolution pics after she was unpacked again and looked at a bit closer.